One of my challenges is dealing with the various visa requirements. They shouldn’t be that complicated but I seem to often find myself in situations that don’t quite fit what the general rules are and trying to determine what that means I have to do is tricky. I didn’t get a visa in advance for Thailand, which seems to usually be the case for me (I just don’t plan ahead well enough to get the Visas when I am somewhere it might be possible, Bangkok etc.). So one of the challenges is I that I don’t have a visa for Thailand, I actually have a 30 day visa free stay. There is talk about extending visas (in internet forums and on the Thailand government site) but it mostly wasn’t clear (at least I couldn’t see it clearly) what it meant for me. Wether extending 30 days by paying 1,900 baht (about US$ 60) at the Chiang Mai immigration office or going on a visa run (and in this case if you got 14 or 30 days was a bit tricky to understand) applied to someone with a visa free stay was not obvious. 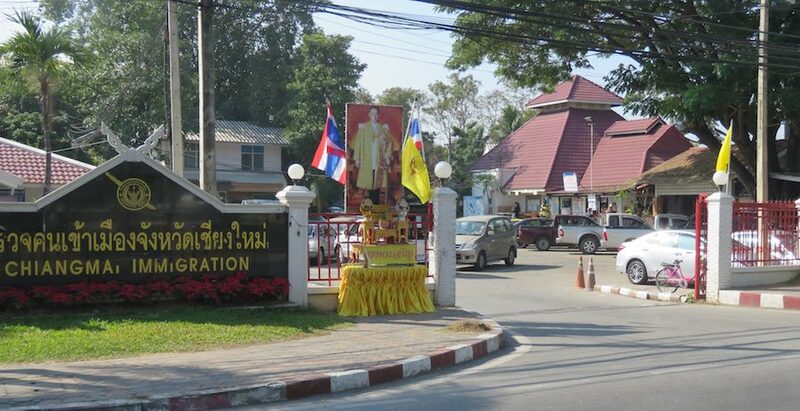 Then I found this great post: How To Extend Your Thai Tourist Visa in Chiang Mai. It is packed with great info. And the good news was I could extend my 30 day visa-free stay for 30 more days (for 1,900 Baht – good money for Thailand’s government) at the local office. And he had detailed instructions on what to do including what to bring and forms to download in advance. He suggests going early and being prepared for a long wait (3 hours) with a longer wait later (and if they can’t finish you that day you have to come back the next day). Also they close down for an hour at lunch time. I think I got lucky. My plan was to go early but I failed and then I decided to just wait a bit and hope to get lucky. I got there at 10:30 and got luckier than I hoped. I was in and out in under 30 minutes. I was surprised how small the waiting area was given how long the waits were suppose to be. And it was nearly full (a few empty seats). There was an indoor area and an outdoor area. People talk about it being air conditioned, it wasn’t when I was there but maybe it wasn’t hot enough. I was in and out much faster than others, I imagine many people waiting when I was there had much more complex cases than mine. I would guess there are about 100 seats for waiting in the main area. Most the building you see is where immigration officers have desk to meet with applicants (for more complex issues than mine – I figure) and the back office. The outside area (under a roof) seats maybe 40 people? 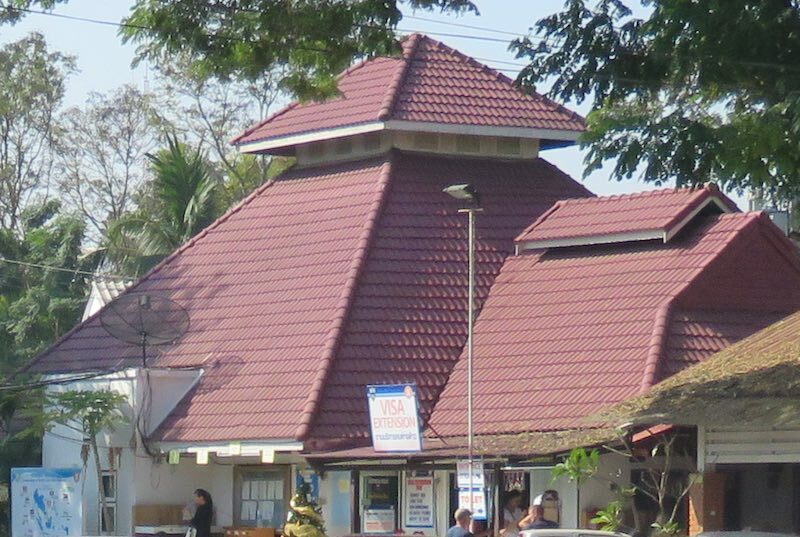 It is on the right of the photo (with the brown colored roof). Since I can get away with not planning far ahead that is usually what I do. Thankfully with a USA passport you can do this fairly well; which is something many in the USA (also other G7 as well as Singapore, Norway and some others) don’t appreciate. Countries largely are lenient with those from rich countries. Sometimes countries get mad at the USA’s visa practices and make this difficult but that isn’t common and they often give up after a bit (the money tourist bring in are too important). I would find it much more annoying to have to apply for and get visa before I went to each country. After getting the stamp extending my non-visa for 30 more days I walked over to the Central Airport Plaza mall which is quite big and has lots of stores. The only one of interest to me was the Authorized Apple reseller and next store an (authorized, I think) Apple service center. I got there before the mall opened at 11 AM. It is near the airport but don’t let the name fool you it isn’t exactly at the airport. You can only get 1 extension per entry into Thailand. Returning to Thailand by air gives you 30 days (if you need a visa you will need that, G7+ others I think? can get visa free entry) and by land gives some people 15 days and maybe only G7, 30 days. Since I am in the G7 category that was enough for me, I am not quite clear on what it means for others, I guess with a double entry visa by land from some countries your visit only gets 15 days, but research that if it is your situation. I think you might be limited to 90 days without a visa every 6 months? I am not quite clear on this but that is my best guess (also I wouldn’t be amazed if it is somewhat haphazardly followed even if it is the rule – that is some people sliding by wouldn’t amaze me and it may well have enforced eased or strengthened over time). It only applies to G7 countries (I believe) since others will need a visa (and the visa will have the limits). All visa and entry rules and enforcement are subject to change at any time and Thailand has been changing things around even more than other countries so get current information for and planed trips.